Book Review: People succeed when they identify patterns that shape their lives--and learn how to change them. This idea--that you can indeed change your habits--draws on recent research in experimental psychology, neurology, and applied psychology. Duhigg looks at the habits of individuals, how habits operate in the brain, how companies use them, and how retailers use habits to manipulate buying habits. This provides some fascinating research and stories, such as the fact that grocery stores put fruits and vegetables at the front of the store because people who put these healthy items in their carts are more apt to buy junk food as well before they leave the store. Duhigg's main contention is that we have the freedom and responsibility to remake our own habits. He says "The most dysfunctional companies can transform themselves". The story of Alcoa is a lesson for every company. Culture can eat strategy for breakfast everyday but not if you focus the organization on the keystone habits that will change the company to what you want it to become. 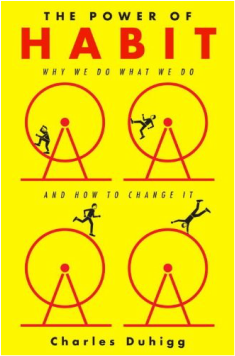 Book Review: ﻿Daniel Pink has hit on a raw nerve that shows up in the reviews. 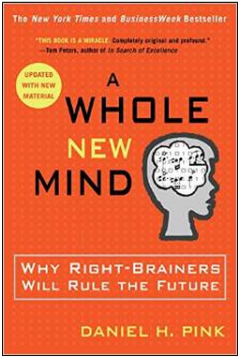 If you are a Right brain thinker - you loved the book. If you are a Left brain thinker you disliked the book. This follows the history of progression of the world labor market. When the Manual labor market dominated and was being replaced by the Knowledge labor market tension arose. The tension that existed between the Manual worker and the Knowledge work is playing itself out again between the Knowledge worker (Left Brain) and the Conceptual worker (Right). The Knowledge worker has no vested interest to agree that the Conceptual/Creative worker is evolution of our advanced society. This is called self-preservation. Book Review: Creativity is crucial to business success. But too often, even the most innovative organization quickly becomes a "giant hairball"--a tangled, impenetrable mass of rules, traditions, and systems, all based on what worked in the past--that exercises an inexorable pull into mediocrity. Gordon McKenzie worked at Hallmark Cards for thirty years, many of which he spent inspiring his colleagues to spit the bonds of Corporate Normalcy and rise to orbit--to a mode of dreaming, daring and doing above and beyond the rubber-stamp confines of the administrative mind-set. In his deeply funny book, exuberantly illustrated in full color, he shares the story of his own professional evolution, together with lessons on awakening and fostering creative genius. Originally self-published and already a business "cult classic", this personally empowering and entertaining look at the intersection between human creativity and the bottom line is now widely available to bookstores. It will be a must-read for any manager looking for new ways to invigorate employees, and any professional who wants to achieve his or her best, most self-expressive, most creative and fulfilling work.